It’s official! Dr. Carol Weideman (Human Performance and Health Education) will be the next president of the WMU-AAUP. Carol has served as the chapter’s vice president for the past two years and will assume the office of president on January 1, 2019, for a two-year term. Dr. Mark St. Martin (Interdisciplinary Health Programs) has been elected vice president after several years as the WMU-AAUP Association Council rep for IHP. Carol and Mark bring a wealth of institutional experience, talent, and smarts to their positions and are looking forward to their new leadership roles. Congratulations to Carol and Mark! Congratulations to all the candidates and to our new chapter leaders! Thanks to all for their willingness to serve. The proposed revisions to the WMU-AAUP Constitution and Bylaws have PASSED. 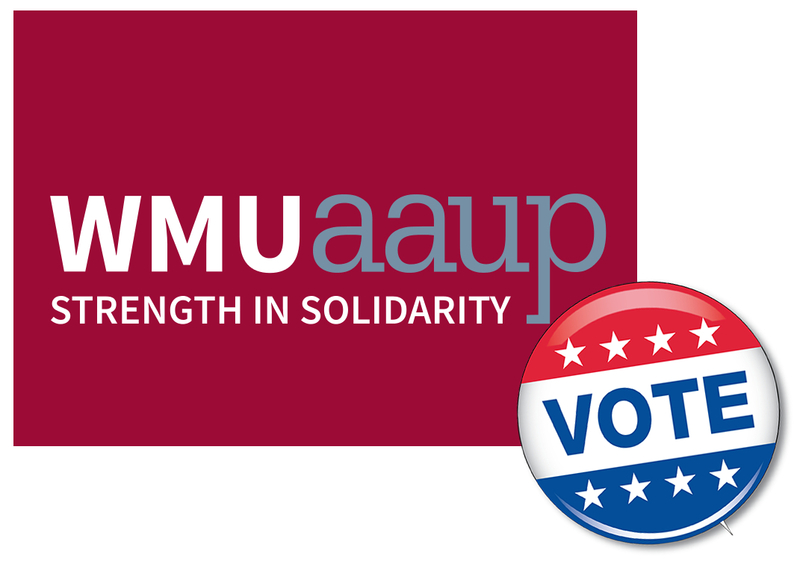 Ballots for the 2016 WMU-AAUP presidential, vice presidential, and Executive Committee election will be arriving in the HOME mailboxes of dues-paying bargaining-unit members via U.S. mail beginning Saturday, October 22, 2016, and continuing through the week. Your individual ballot will include the candidates for chapter president and vice president, along with your college’s candidate(s) for the WMU-AAUP Executive Committee, as well as a proposed change to the chapter’s constitution and bylaws regarding an adjustment to the dates during which officer elections are held. If you don’t receive your ballot at your home address by Wednesday, October 26, please contact the WMU-AAUP office at 345-0151 or email staff@wmuaaup.net to make sure your contact information is up to date. Completed ballots must be received by the auditor’s office in the self-addressed, stamped envelope enclosed with your ballot no later than 12 noon on Monday, November 14. Thank you for participating in this important process. Note: Executive Committee terms are staggered, with the terms of half the seats expiring in even-numbered years and the other half in odd-numbered years. Serving on the WMU-AAUP Executive Committee involves a significant time commitment and a tremendous amount of responsibility. Our four outgoing members are people of courage, vision, wisdom, passion, and — thankfully and necessarily — humor. We are going to miss working with these amazing colleagues. Please join us in thanking them for their outstanding service. They brought a lot to the table, and their extraordinary efforts will be paying dividends to the chapter and to the faculty for years to come. On behalf of the Nominations and Elections Committee, we would like to report the results of the WMU-AAUP officer and executive committee member election, as tallied by our external auditor. We believe there was a spirited campaign for the office of President and that this sort of democracy is vital to a stronger, more effective faculty union. Whether your preferred candidate received the most votes or not, we encourage you and them to set aside what happened during a campaign and to get on with the important collective business of the WMU-AAUP. The total number of votes cast was 341, which indicates a strongly engaged membership. We thank you for your involvement. In all cases, the terms for the positions are two-year terms and start on January 1, 2015.